A true taste of Melton Mowbray. Our classic Pork Pie, a wedge of smooth, creamy Stilton Cheese (enhanced with a jar of Apple Chutney), 6 of our best-selling thick pork sausages and a bottle of infamous Melton Red Beer from the Belvoir Brewery. The Melton Hunt Cake (a rich moist fruit cake) and a unique Dickinson & Morris Jute Bag make this a very popular item throughout the whole year. 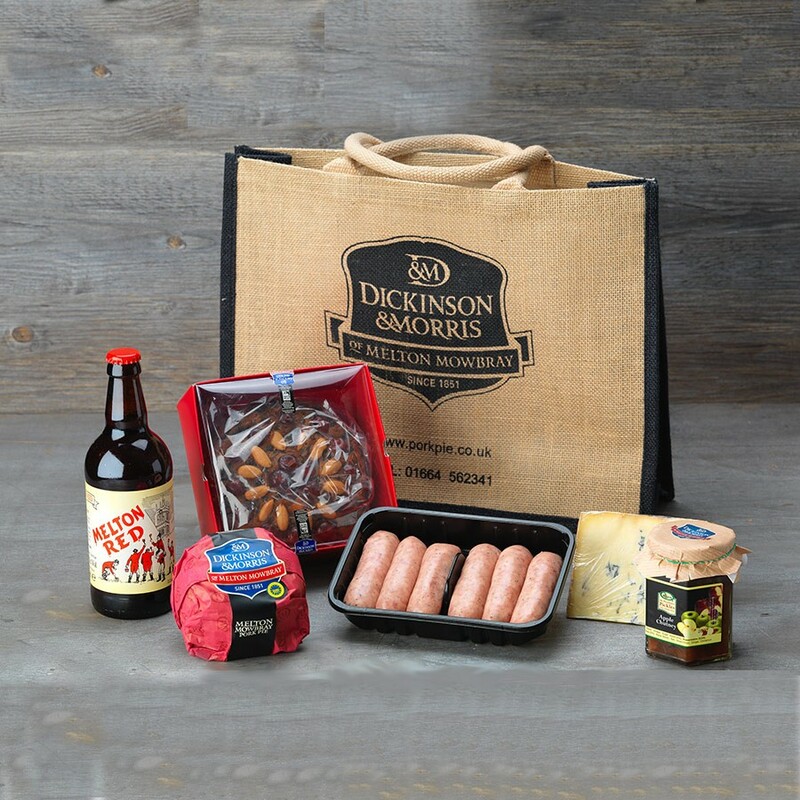 Our Flavour of Melton hamper, as it contains perishable items is carefully packed into in an insulated box. Please note: since this hamper contains alcohol so you must be at least 18 years of age to purchase. Large Dickinson & Morris Melton Mowbray Pork Pie (454g), Wedge Blue Stilton Cheese (454g), Melton Hunt Cake (907g), Apple Chutney (280g), Dickinson & Morris Thick Pork Sausages (454g), Bottle Melton Red Beer (500ml), Dickinson & Morris Jute Bag.